WWE Universal Champion Brock Lesnar is not a man who is known for getting along with other WWE Superstars. 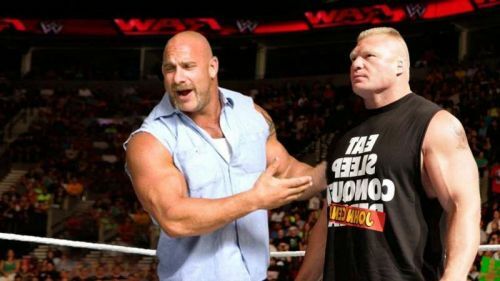 There are several Superstars with whom it is known that Lesnar has a less than a positive relationship. He has been involved in several confrontations backstage with other WWE talent and is known for rubbing people the wrong way. The fact that he is more involved with UFC, and does not care about WWE other than as an avenue to make money has also been a factor for people judging him. However, there are WWE wrestlers who are good friends with Brock Lesnar -- or are at least close to 'The Beast Incarnate'. In this article, we will take a look at 5 WWE Superstars who are actually friends with Brock Lesnar. Dwayne 'The Rock' Johnson has been a huge part of Brock Lesnar's start in WWE. Without The Rock, Lesnar might not have been the dominant force that he is today. Currently, The Rock might have been away from WWE for a long time, focusing on his career in Hollywood, but there was a time where he was one of WWE's biggest Superstars. He was one of the faces WWE was known for in the Attitude Era, and along with 'Stone Cold' Steve Austin was partially responsible for helping WWE to defeat WCW. When Brock Lesnar first made his debut in WWE, he was known as the 'Next Big Thing' in the company. While other Superstars were reluctant to put him 'over' with the crowds, The Rock was one of the first ones to agree to it. That's exactly what he did, helping Lesnar to secure his first big win at WWE SummerSlam 2002. Other than this, Lesnar also mentioned being thankful to the Rock for helping him out behind the scenes towards the beginning of his run in WWE. If the Rock does decide to return one more time, it would not be the biggest shock in the world for it to be in a program with Brock Lesnar.